Comparing cross-country similarities and differences can be useful to understand the origins of health inequality, but is hampered by a lack of harmonised and comparable data. This column brings together panel data from ten countries in continental Europe, England, and the US to compare inequalities in total life expectancy, disability-free life expectancy, and years spent in disability across education levels and gender. Among the findings are that ‘women get sicker but men die quicker’ is to a large extent a low-education phenomenon. Individuals that are more educated, wealthier, or earn higher income experience better health and higher life expectancies in the US (Pijoan-Mas and Rios-Rull 2014). Health and mortality inequalities are important for the outcomes of many public policies. For instance, the redistributive power of retirement pensions may be partly eroded if not overturned by the longer life expectancies of individuals of higher socioeconomic status (Brown 2002, Fuster et al. 2003). Likewise, differences in disability-free life expectancy is an essential factor in shaping both the effectiveness and the welfare impact of the retirement age delay that is scheduled in several European countries (Wen 2017), while differences in disability years is a central factor for the redistributive consequences of public policies financing long-term care (De Nardi et al. 2016, Bueren 2017). However, because of the lack of harmonised and comparable data, little is known about the extent of health and mortality inequalities across countries (Majer et al. 2010, Avendano et al. 2011). This is unfortunate because, as has happened with the literature in wage and income inequality, efforts to understand the origins of health inequality can benefit from both the similarities and the differences to be found across countries. In our recent paper (Bohacek et al. 2018), we compare the inequality in total life expectancy, disability-free life expectancy, and years spent in disability across groups of different education level and gender across ten countries in continental Europe as well as England and the US. To do so, we combine harmonised and comparable household panel data from Europe (SHARE), England (ELSA), and the US (HRS). Our paper is the first to use SHARE data for this purpose. Specifically, we estimate a continuous time duration model for males and females of different education levels in each country. We use the estimated model to compute multi-state life tables by gender and education, starting at age 50 and comprising the period from 2002 to 2015. This delivers the associated gender and education differences in age-50 life expectancies. We use college graduation as a measure of high education and absence of limitations in daily-living activities as a measure of health. Therefore, the terms ‘bad health’, ‘disability’, or ‘morbidity’ as we use them refer to functional health. Furthermore, following Pijoan-Mas and Rios-Rull (2014), we use the multi-state life tables to break down the observed differences into: advantages in health already present at age 50, advantages in health transitions, and advantages in survival rates conditional on health. Common across countries, we find substantial interactions between socioeconomic status and gender. That is, there is an education gradient (as defined as the difference between college and non-college groups) that varies between males and females, and a gender gap that varies across education groups (see Table 1). Notes: LE stands for life expectancy, DFLE for disability-free life expectancy, and YD for average years in disability, all at age 50. The education gradient is the difference between college and non-college, while the gender gap is the difference between females and males. First, the education effect on life expectancy is larger for males than females. In particular, the average education effect on life expectancy across our 12 countries is 3.4 years for males and 2.2 years for females. Furthermore, we find that college-educated individuals spend fewer years in disability despite living longer, and that this advantage is larger for females: college-educated males spend 0.6 fewer years in disability, while college-educated females spend 1.7 fewer years. Hence, there is a ‘compression of morbidity’ across education groups that is especially important among females. The multi-state life tables reveal that the education advantage in both the transitions between health states and the survival rates conditional on health are quantitatively important for the education effect on life expectancy. Instead, the education effect on disability years arises because of the education advantage in health transitions and despite the lower conditional mortality of the more educated. Finally, we find that the education advantage in conditional survival is larger among males, which explains why a larger effect in life expectancy is shown in males, and that the education advantage in health transitions is larger for females, which explains their larger compression of morbidity. Second, as is well known, we find that women live longer than men but spend more years in disability. This apparent puzzle has been described as ‘women get sicker but men die quicker’. More importantly, this pattern is much stronger within the non-college-educated population, which is the flip side of the gender-education interaction described before. In particular, within the low-educated population, females live 3.9 more years than males but spend 1.4 more years in disability. In contrast, within the college-educated population, the female advantage in life expectancy is 2.7 and the female disadvantage in disability is only 0.3 years. Therefore, ‘women get sicker but men die quicker’ is to a large extent a low-education phenomenon. Looking at the multi-state life tables, we find that this pattern occurs because women, especially the less educated, experience higher survival rates than men once in poor health (confirming that ‘men die quicker’) but female health transitions are similar to those of males (so women ‘stay’ rather than ‘get’ sicker). In addition to these common patterns, we also find that our data display ample heterogeneity across countries. Figure 1 shows the education effects and Figure 2 the gender gaps in Western Europe (Austria and France), Eastern Europe (Czech Republic, Estonia, Poland, and Slovenia), the Mediterranean (Italy and Spain), and Scandinavia (Denmark and Sweden), plus England and the US. We summarise our findings as follows. First, Eastern and Western Europe exhibit the largest education effects on life expectancy for males (4 and 3.9 years, respectively), the US and England are in the middle (3.6 and 3.4 years), and the Mediterranean and Scandinavia present the smallest gradients (3 and 2.1 years). When looking at females, the largest effects on life expectancy are still in Eastern Europe (3.9 years) and the smallest are in the Mediterranean (0.7 years). With a few exceptions, the differential effects on disability-free life expectancy do not much change the ranking of countries. 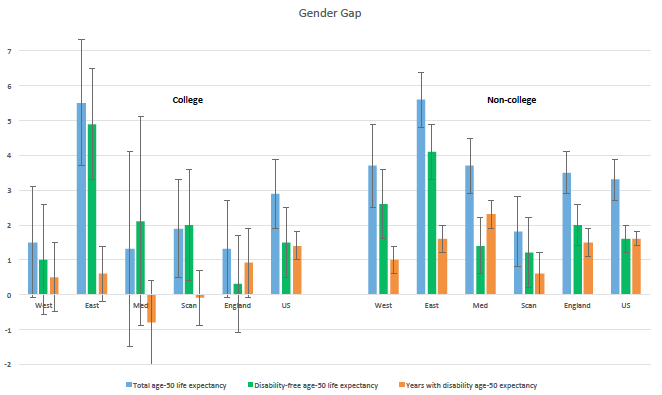 The most salient feature is that the US and England become the most unequal countries in terms of the education effects on disability-free life expectancy for males (with 5.3 and 4.7 years, respectively), while the most unequal regions for females are Eastern Europe and the US (with 5.1 years each). Note, hence, that the US stands out because of its largest differential effects on disability-free life expectancy, not on total life expectancy. 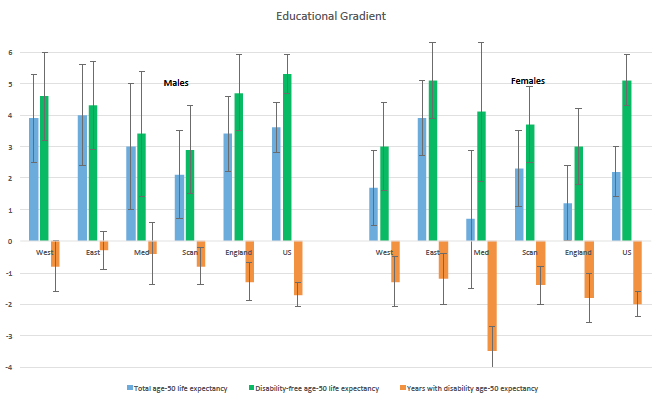 This happens because the US exhibits an education advantage in disability years that is the largest among males (1.7 years), and second largest among females (2 years); that is, the detrimental effect of low education on life expectancy is amplified the most in the US when we consider its gap between healthy and disability years. Finally, the education advantage in disability years is particularly big among females in the Mediterranean, with 3.5 years. Second, the female advantage (or male disadvantage) in total and disability-free life expectancy is distinctly largest in Eastern Europe for both education groups, with 50-year-old males enjoying 5.5 less years of life in this region and spending between 4.1 and 4.9 less years in good health. Within the less-educated population, where the gender differences are more apparent, the gender gap in disability-free life expectancy is lowest in Scandinavia (1.2 years) and the Mediterranean (1.4 years). However, these two regions show opposite patterns in the gender gap in disability years within the less-educated population: while females in Scandinavia only spend 0.6 more years in disability than males, females in the Mediterranean spend 2.3 more years in disability than males. In order to better understand the differences across countries, we compare the education effects in each country with the share of GDP spent on public health care. In this regression, with an admittedly small number of data points, we find a negative, strong, and statistically significant correlation between public spending on health and the education effect on life expectancy for males (see panel a in Figure 3). The estimated coefficient implies that the education effect on life expectancy for males is 1.8 years smaller when the health spending goes from 4.6% of GDP (the lowest in the sample, Poland) to 8.8% (the highest in the sample, Denmark). 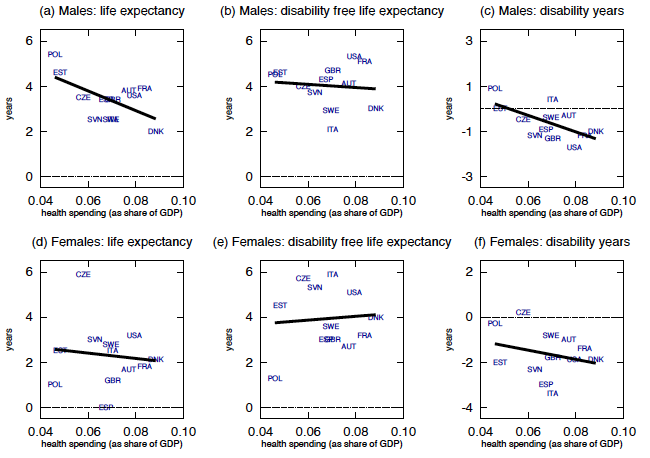 All the effect comes from the differential effect on disability years: countries with more public spending in health tend to have similar differential effects on disability-free life expectancy as other countries, but larger (in absolute value) effects on disability years (see panels b and c). These correlations suggest that public spending in health allows less-privileged individuals to live longer but not in better health, which is consistent with public spending in health improving the survival of less-educated individuals in bad health but not improving their health transitions. For females, public spending in health is also negatively related to the education effect on life expectancy and disability years, but with a smaller slope than for males (see panels d to f). This result is consistent with the above interpretation: public spending in health diminishes the education effect on life expectancy by reducing the education advantage in survival and, as also discussed above, survival differences across education groups matter less for females. Avendano, M, R Kok, M Glymour, L Berkman, I Kawachi, A Kunst and J Mackenbach (2011), “Do Americans have higher mortality than Europeans at all levels of the education distribution? : A comparison of the United States and 14 European countries”, in EM Crimmins, SH Preston, and B Cohen (eds), International Differences in Mortality at Older Ages: Dimensions and Sources, Washington DC: National Academies Press. Bohacek, R, J Bueren, L Crespo, P Mira and J Pijoan-Mas (2018), “Inequality in life expectancies across Europe”, CEPR Discussion Paper 13184. Brown, J (2002), “Differential mortality and the value of individual account retirement annuities”, in M Feldstein and JB Liebman (eds), The Distributional Aspects of Social Security and Social Security Reform, Chicago: University of Chicago Press. Bueren, J (2017), “Long-term care needs: Implication for savings, welfare and public policy”, mimeo, CEMFI. De Nardi, M, E French and J Jones (2016), “Medicaid insurance in old age”, American Economic Review 106: 3480–3520. Fuster, L, A Imrohoroglu and S Imrohoroglu (2003), “A welfare analysis of social security in a dynastic framework”, International Economic Review 44: 1247–1274. Kitagawa, EM, and PM Hauser (1973), Differential mortality in the United States: A study in socioeconomic epidemiology, Cambridge, US: Harvard University Press. Majer, I, W Nusselder, J Mackenbach and A Kunst (2010), “Socioeconomic inequalities in life and health expectancies around official retirement age in 10 Western-European countries”, Journal of Epidemiology and Community Health 65(11): 972-979. Pijoan-Mas, J, and JV Ríos-Rull (2014), “Heterogeneity in expected longevities”, Demography 51: 2075–2102. Wen, J (2017), “Occupational retirement and social security reform: The roles of physical and cognitive health”, mimeo.